In celebration of the 10th anniversary of Millarworld, Image Comics is pleased to reveal two connecting MPH #2 variant covers featuring art by critically-acclaimed artist Leinil Francis Yu and featuring the characters of the Millarworld Universe. The all-new Millarworld Universe zooms ahead at breakneck speed with the second issue of Millar and Duncan Fegredo’s urban adventure tale, MPH. A good guy dealt a tough hand, Roscoe’s found the perfect Get-Out-of-Jail-Free Card in the form of super-speed pills called MPH. Now that he knows who put him away, he’ll find that revenge is a dish best served... lightning fast! 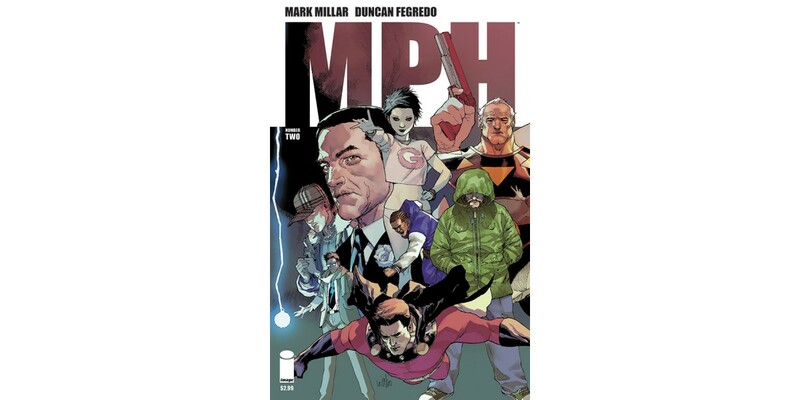 MPH #2 will be available in stores on June 18 and can be pre-ordered with Diamond Code APR140580. Variant cover C featuring art by Leinil Francis Yu will be available for pre-order with Diamond Code APR148239. Variant cover D featuring Yu's art will be available for pre-order with Diamond Code APR148240.